Miss Grace Fairchild is under no illusions about her charms. Painfully plain, she is a soldier’s daughter who has spent her life being useful, not learning the treacherous ways of the ton. She may have been caught in a scandal with society’s favorite rogue, but how can she marry him when it means losing herself? Diccan Hilliard doesn’t know which of his enemies drugged him and dumped him in Grace’s bed, but he does know the outcome. He and Grace must marry. To his surprise, a wild, heady passion flares between them. Yet Diccan is trapped in a deadly game of intrigue Grace knows nothing about. Will his lies destroy Grace just as he realizes how desperately he needs her? And how can he hope for a future with her, when an old enemy has set his murderous sights on them both? 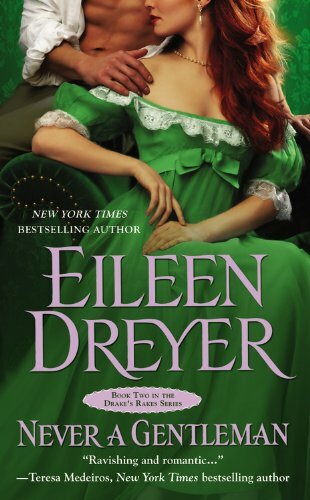 USA Today best-selling author Eileen Dreyer has won five RITA Awards from Romance Writers of America, which secures her fourth place in the Romance Writers of America prestigious Hall of Fame. Eileen is an addicted traveler, having sung in some of the best Irish pubs in the world. Eileen also writes as Kathleen Korbel and has over three million books in print worldwide.Born and raised in Missouri, she lives in St. Louis County with husband Rick and her two children. I really enjoyed reading about Grace and her love / hate relationship with Diccan (and wondering if it was intentional that Diccan’s name starts with an unflattering nickname for certain men, since it is appropriate here). Yes, Diccan was not my favorite male lead, but given the time and place of this story, he couldn’t be anything else. Grace is a strong woman and very likable even though she has low self esteem when it comes to looking in the mirror. The background of war never makes for an easy time and these two lovers have lots to deal with. I don’t think you need to read the first in this series, Barely a Lady, but it would help with the secondary characters who also appear in that book. This giveaway is sponsored by Forever Romance and three copies will be available. +1 SOCIAL NETWORK THIS GIVEAWAY! Get one additional entry for each post on the social network of your choice, one per site, per day. +1 leave a comment- you can do this daily! Love this cover and sounds fantastic thanks for the giveaway! Mary-thanks so much for participating in my blog tour. I’m so glad you enjoyed Gentleman. Grace was one of my favorite characters I’ve ever written. There’s something about plain heroines that just speaks to me. In celebration, I’m also running a contest on my website. The grand prize is a sapphire, emerald and ruby bracelet I brought home from Jaipur, India. 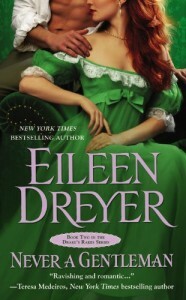 Love historical romance and love this cover! Thanks for the giveaway!